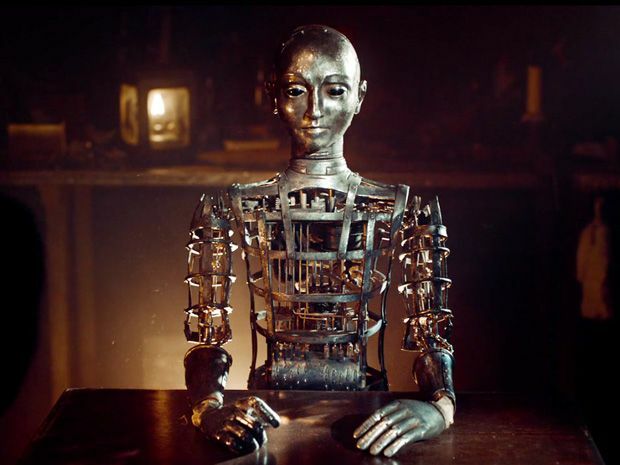 “Automaton” from Martin Scorsese’s movie Hugo. As mentioned in a previous post, the idea for Big John Irons all started with this little guy. “The Automaton” as seen in the movie Hugo. And he’s not just a pretty face either. If you watch the movie for yourself, you’ll see him draw an incredibly detailed picture all on his own. It’s an excruciatingly delicate feat of clockwork engineering, kind of like a really intricate music box. His intriguing nature, and the early 1900s setting he lives in, inspired a thought in my head that eventually morphed into John. 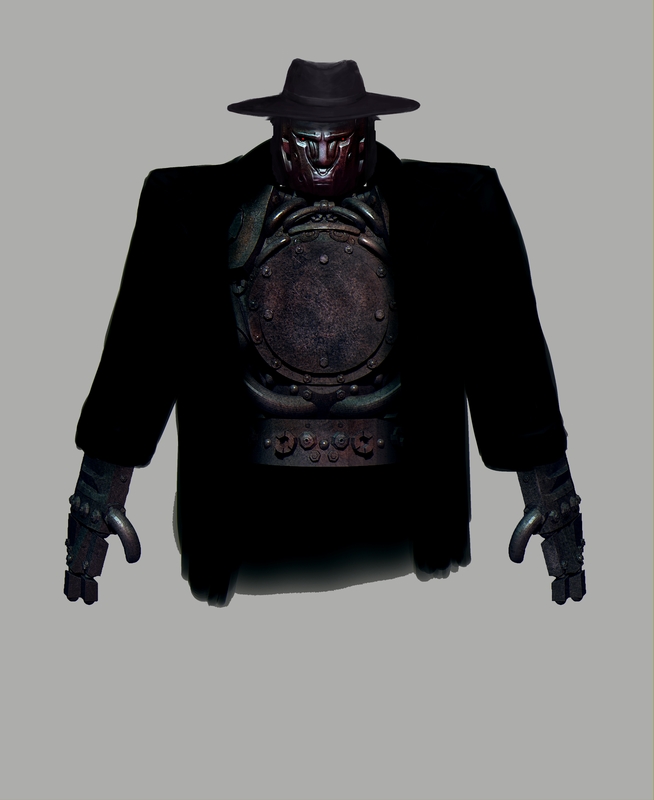 A fearsome clockwork automaton that works as a mob enforcer in 1920s Chicago. Bam! There it is. Well, not quite. My first vision was of a clockwork knight of some sort. Sporting the head of a lion and living in the Paris catacombs. A cool idea to be sure, but sort of a dead end from my own perspective. I mean if I were a proper fantasy writer, I could have written up a big Harry Potter-style universe surrounding the lion-headed mechanical knight, and explained what the heck he was doing down there. But honestly, I would’ve gotten bored with that narrative the minute he first encountered someone and yelled “Boo! I am the lion-headed mechanical knight! Beware!” I needed a better story. That gave me the setting and the profession. It never crossed my mind to make my new character an Elliot Ness flunky, knocking over speakeasies and throwing bad guys in paddy wagons. No, a guy who looks like that has to be on the side of the mob. It’s type-casting, but it is what it is. From there, I came up with the every-man sort of name “John”, which turned into “Big John”, and finally “Big John Irons” for obvious reasons. I knew then that this was going to be my flagship series, and I immediately went to work writing outlines for book after book after book. Actually they were going to be graphic novels at first, because I knew the visuals were going to be freaking awesome. But such things are expensive to produce, and as the stories took shape, I realised that I liked my descriptions better than I liked the illustrations I was having drawn. Call me a control freak, but ultimately I think the human imagination, when prompted, can produce visuals more spectacular than those drawn by hand. I put my focus on getting beautiful covers for each novel to spur things along, and left it at that. 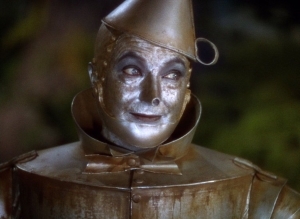 “The Tin Man” from Wizard Of Oz. Inanimate characters are nothing new in the fiction world. One that jumps to mind is the Tin Man from Wizard Of Oz. Always helpful, loyal, and apparently prone to singing, this particular artificial life form was…well it was a man with a funnel on his head. Beloved as he is, this guy’s quest for a heart ended with the obvious conclusion that he already had one. Good for him. There’s nothing at all wrong with that. It’s a very endearing trope, and very watchable. In fact, if they ever create artificial life, I hope to god that it does share our cuddly human values, for everybody’s sake. But I hate being like everybody else, so when it came my turn to add something to the tin man mythos, I opted to create something downright alien. A kind of life that barely seems alive at all by our standards. A mute, unemotional machine with motives and values that we can scarcely understand. John embodies the personality you’d attribute to the likes of Thor’s hammer Mjolnir, if you ever took the time to ponder what a hammer thinks and feels. Ultimately, what the two of them understand above all else is purpose. And in the hands of the mob, John’s purpose becomes very colourful indeed. When you’re a Chicago mobster in the 20s, a stylish hat pretty much goes without question. At least if you’re the title character it does. Hence John’s fedora. I guess I could’ve dressed him up in a suit, nice shoes, the whole deal, but that seemed impractical. Not to mention it normalises his appearance just a little too much. 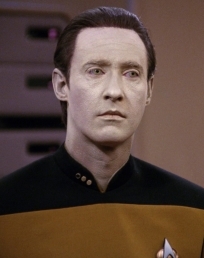 I wanted him to be able to avoid scrutiny from a distance, but he’s still very much the boogeyman of this universe. A monster. So he gets a thick black trench coat and nothing more than that, so as to showcase just how frighteningly different he really is. “Hammerstein” as seen in the Judge Dredd movie. 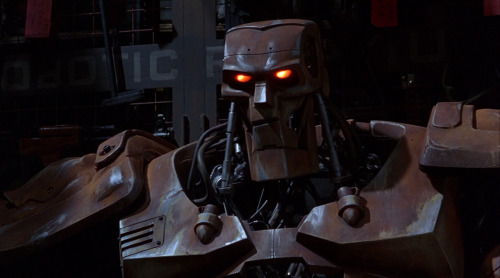 Because of his red eyes, some will assume I tricked out a terminator as the basis for John’s body, but actually that was largely inspired by Hammerstein from Judge Dredd. With a considerable steampunk twist though. For example, the distinctive circular hatch on John’s chest is similar to what you’d find on an old steam locomotive. The giant wrench that he carries on his back, both for winding himself and for use as a weapon, was also railroad-inspired and I think it really drives home his old school bruiser image, more so than a gun or a pair of laser eyes would. Of course he’s also devoid of anything remotely electrical. Clockwork through and through. Early concept art for John. Somewhat thinner than he ended up in the final version, and the hands would be redesigned. In terms of size, John is ungainly to say the least. Roughly proportional to Marvel’s Incredible Hulk, and weighing around 1000 pounds, he tends to bend floorboards and break door frames wherever he goes. Often times my readers will wonder just how he squeezes into the places that he does, but that’s half the fun for a character like this. He’s got mystery. The artistic genius who ended up bringing John to life on my book covers is Igor Krstic of Serbia. I swear he didn’t sleep that week, and the results were just phenomenal. He filled in details I couldn’t yet envision, and turned Hammerstein’s face into something a great deal more unique. I’ll be going back to him whenever possible in the future. As you read about John in the coming years, you’re going to notice he’s not “as dumb as he looks.” Though he plays the role of a brutish thug, consistently taking his orders from the mob boss Ellie, the way he goes about his duties is frequently more creative than simply wailing on people with his bare hands (don’t worry he does that too). He’s not a braggart about it, but opponents who think they can casually outsmart John will find it’s not nearly that easy. Displaying his subtle thought process is difficult for me as a writer, but I’m having a great time plotting out all the various problems and solutions to come. I think you’ll enjoy reading them as well. Don’t want to give away any major plot points to people that haven’t read the book yet, but I couldn’t discuss the making of Big John Irons without also giving you the lay of the land. Pretty much everyone knows the cliches surrounding Chicago (I’m not talking about pizza). Booze, corrupt cops, guys in suits and hats shooting at each other with Tommy guns. You’ll find all of that in my books, faithfully recreated wherever possible. In other words, I strive to keep the noir atmosphere commonly associated with that period, with anomalies like John appearing occasionally to stir things up. 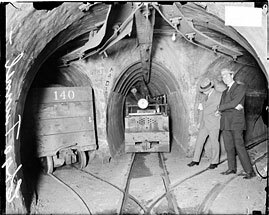 I’ll bet you’ve never heard of the Chicago Tunnel Company. They stopped being a thing before you were born, and quietly became forgotten. But back in the day, a network of freight tunnels ran beneath the city. Small electric trains buzzed about, delivering mail and coal directly into the basements of local buildings. It’s really quite extraordinary. Naturally, I was delighted to find out about them, because they make for a terrific method of concealing the movements of somebody like John. They play a prominent role in many of the coming stories. 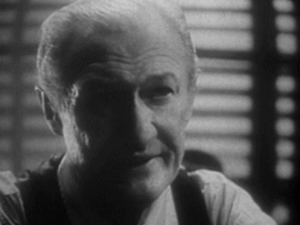 For those wondering about Franky the bartender’s role in Big John Irons, I will say that he’s a fixture, much like Ellie. He embodies the endearing “wise man” character that you find in so many classic stories throughout film and literary history, but with a twist. Franky definitely has a backstory of his own, and one that will be revealed eventually. Expect to see him in the background of most stories, occasionally taking a prominent position. He’s possibly my favourite of all the characters. There’s certainly more to see in this universe I’m creating, but I hope you enjoyed this snapshot. Stay tuned for future blog posts as each book comes out, and also look for free stories that I’ll be posting here and there. For now, happy reading! Welcome to the homepage of Stephen Brennan the fiction writer. Your first question might be “Who’s that grim fellow with the metal face headlining the page?” That’s John, the title character of my flagship series Big John Irons. Sort of a gothic horror dieselpunk something or other. I recommend you check him out, and also the various free features I’ve strewn about the site. I thank you for your patronage, enjoy! Copyright © 2019 Writer's Blog for Stephen Brennan.